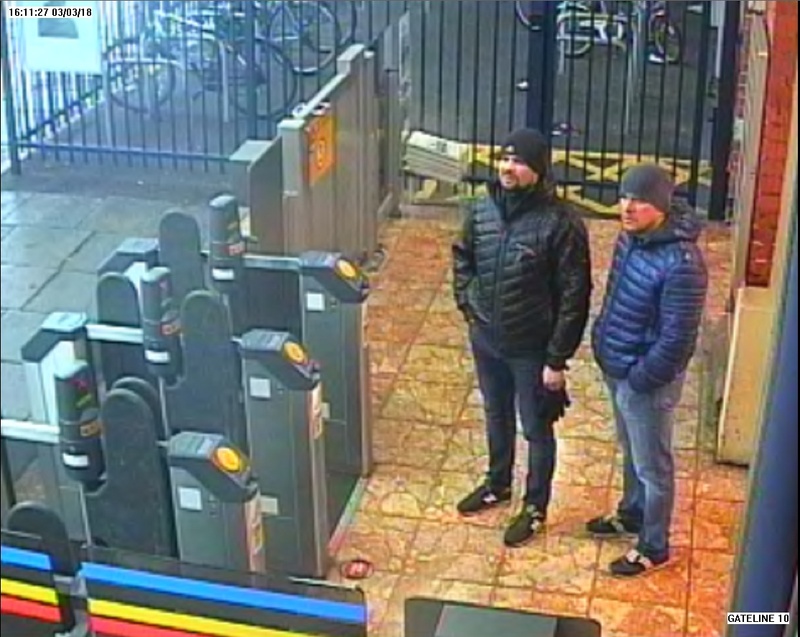 Two men accused by the British government of being Russian spies who used a military-grade poison to try to kill a turncoat ex-KGB colonel and his daughter in the English city of Salisbury have gone on Russian television to say they were merely tourists. The suspects, Alexander Petrov and Ruslan Boshirov, believed by Scotland Yard to be aliases used by members of Russia’s GRU military intelligence service, broke their silence to speak with an interviewer for Russian state-funded news channel RT on Sept. 13. 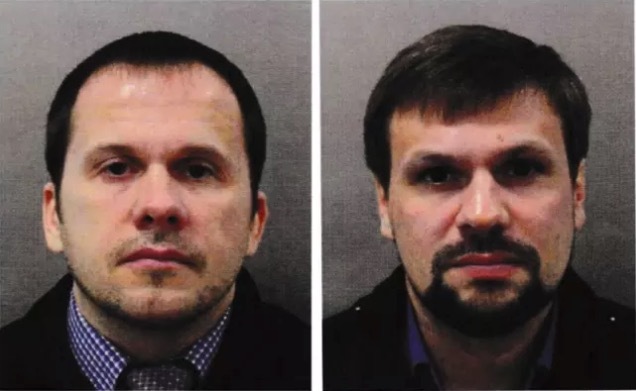 The men said their real names are indeed Petrov and Boshirov, and that they visited Salisbury to see its famous cathedral. “Salisbury, a wonderful town?” asked the interviewer, RT’s editor-in-chief Margarita Simonyan, with an apparent note of incredulity in her voice. The interview was immediately denounced as a farce in the UK, according to the British tabloid The Mirror. Anticipation of the public appearance of the two suspected state assassins was whipped up by none other than Russian President Vladimir Putin. Speaking on Sept. 12 at an economic conference in Russia’s far eastern city of Vladivostok, Putin said the two suspects had been found and insisted that they don’t work for the military. Putin also gave assurances the two suspected Russian GRU military intelligence officers aren’t state agents and hinted that they would soon appear on television to tell all. “Of course they are civilians,” Putin replied to a question by the moderator. He then called on the men to come forward. “Sure, to my studio on Saturday,” the moderator replied, setting the stage for what may have been the start of a carefully rehearsed set of interviews. The case bears similarities to the 2006 assassination on British soil of former KGB agent Alexander Litvinenko. His suspected killers, Andrey Lugovoy and Dmitry Kovtun, were paraded in Russian media as they forcefully denied any involvement. Ex-KGB agent Lugovoy, now a national celebrity and politician, fought extradition attempts by Scotland Yard for the murder of Litvinenko, who was poisoned in a similar fashion to the Skripals. Lugovoy met with Mark Campbell of the Times of London for an in-person interview shortly after the attempt on Skripal’s life in March. “I said to my wife, ‘Here we go, it’s starting again.’ Now, everyone’s calling me, making a comparison with me,” Lugovoy said. Putin’s suggestion that the alleged state assassins might break cover to take part in a similar public expose caused Russian media to react with immediate glee. Within minutes, Putin’s remarks became top news on Russian TV, which called them “simply sensational,” according to the BBC. A talk show on the state-controlled Channel One speculated whether the fallout from the accusations, discredited by Putin’s revelations, would force British Prime Minister Theresa May to resign in embarrassment. Kremlin media also revealed that one of the suspects, Petrov, might appear on television next week to make a public statement. “You honestly look very tense,” Simonyan said to the two men during the interview. “When your life is turned upside down, you don’t know what to do and where to go. We’re afraid of going out, we fear for ourselves, our lives and lives of our loved ones,” Boshirov said. Britain and more than two dozen other countries expelled a total of 150 Russians working under diplomatic cover after the Skripals were poisoned. Russia retaliated by kicking out a similar number of envoys. May said the use of a chemical weapon on British soil was carried out by officers of the GRU intelligence service and was almost certainly approved “at a senior level of the Russian state.” Scotland Yard published a series of surveillance images allegedly showing the two suspects in action. 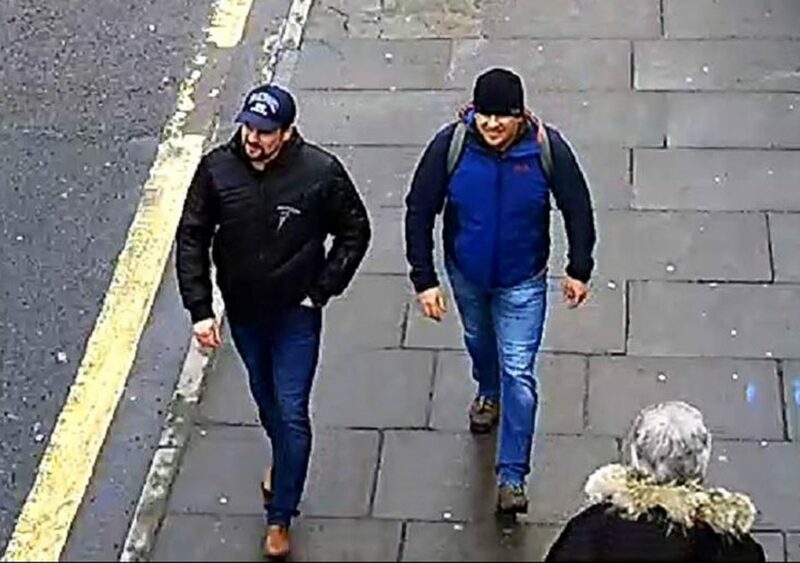 The two were caught on camera at various points of their weekend trip to the UK, including on March 4, about a mile from Skripal’s house, where the chemical toxin was sprayed on his door. Later that same day, Skripal and his daughter were found unconscious on a park bench, seriously ill from having come in contact with the toxin. The alleged assassination attempt caused Skripal and his daughter to be hospitalized and resulted in the death of Dawn Sturgess, a British mother of three. 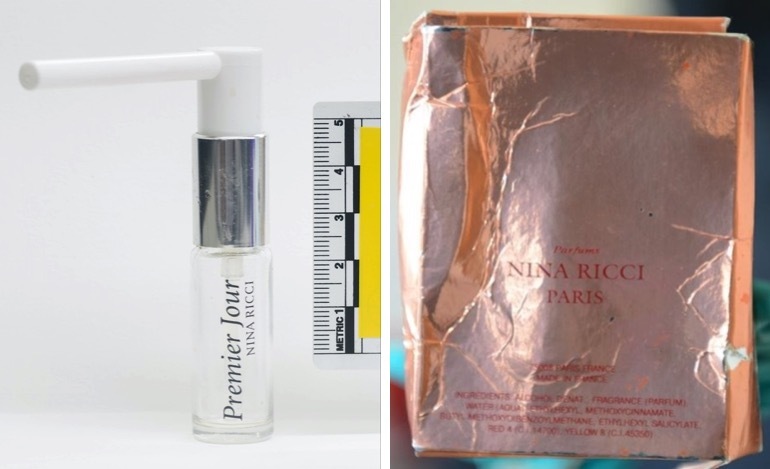 The toxic nerve agent also left two other Britons—Sturgess’s boyfriend, Charlie Rowley, and police officer Nick Bailey—suffering from the effects of the exotic poison. 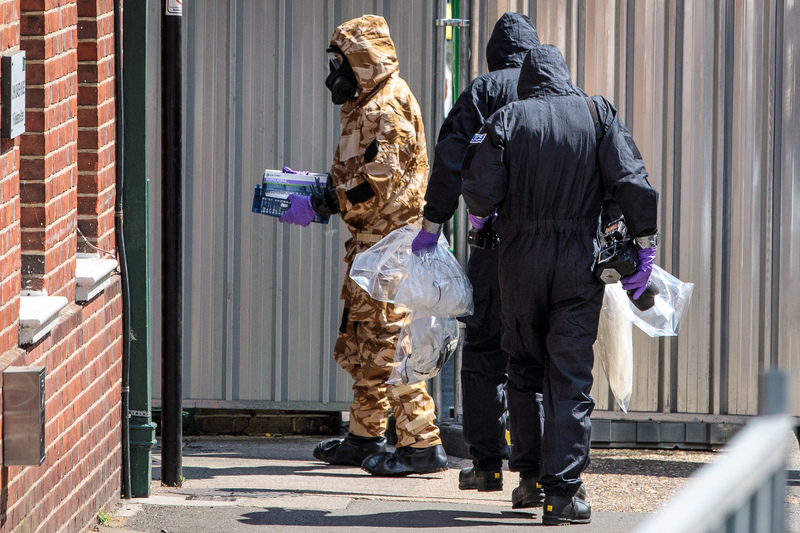 Britain has charged Boshirov and Petrov in absentia with the Novichok poisoning. Allies of Britain issued a joint statement pledging to join May’s campaign against the Russian GRU spy agency. “We have full confidence in the British assessment that the two suspects were officers from the Russian military intelligence service, also known as the GRU, and that this operation was almost certainly approved at a senior government level,” the statement issued by Canada, France, Germany, and the United States says. Moscow has vehemently denied any claims that it had anything to do with the attack and, to discredit the accusations, has conducted multiple disinformation campaigns, according to British authorities, of which the interview with the two suspects on Russian-controlled television may be another example.